Can really push these in the paved twisties and still feel safe. Rode for an entire day in the rain without issue. Have good control on smooth to moderate dirt roads. Put 2300 miles on a new set on my last trip and (maybe) lost 1/16" of tread off the rear tire. In my estimation, the BEST "compromise" tire for on/off road. are a very simple pattern street tire, that lots of people think are dual sport tires. they're heavy, but the extra weight is to be expected with all the tread that is on them. I've ridden a few fingered miles on them and enjoyed very good traction on the pavement and similar on dirt roads. this is not an off road tire. nice tires very smooth compared to my OEM Trailwings. I have run through three sets of these tires and really like how they work. So far I have about 30,000+ miles (70% street, 25% gravel, and 5% trail) on on the 705s and see no reason to change. I think this is my third rear 705, and I'm still very content with the tread life and performance of this tire. Because it can be used either on the front or rear, depending on application, I had trouble finding the 130/70-17 tire, it might help for the staff at RMATV to change the category these (and probably many other tires) are in, from f/r to r and also f, if that makes sense. The Shinko 705 has become my "go to" tire for my Triumph Scrambler. I think it provides confidence inspiring grip on the road. It's decent for dirt and gravel roads, but not what I'd call an off-road tire. And, I'd say it's decent only at that, not the greatest. I find it's not too confidence inspiring in sand or mud. So, for a dry dirt road with mostly rock or hard pack, it's great. If that same road is wet, it's not so great. Wet traction on tarmac is just fine. 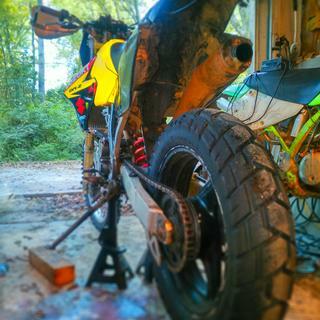 I've had great luck with the Shinko 705 so far, better than with any other tire I've used on my Scrambler. Good tires for the money! Rides smoother and handles better on gravel then I expected. Good tires for the price. I ride nearly all year around and I commute a total of 44 miles. Tires lasted about 2 years, sorry didn't track hours or miles. My commute varies from city, freeway at 70 mph and curvy backroads. I never had a issue with traction or holding a line in corners. Over the past 2 years i rode gravel roads, small loose pebble trails , large tennis ball size rocks, wet clay, hard pack trails, light mud, snow and ice covered gravel with no real issues with no real issues. Tires always felt connected to the trail. I've gone through several sets of these tires on my KLR. Typically I get about 5,000 miles out of a rear tire, more at the front. This is a couple thousand more miles than I get out of sport-touring tires on my street motorcycles. Admittedly, most of my KLR riding is on pavement, but these tires work well off road, but you'd want to choose something with a more aggressive tread (a knobbly, for example) if you want to ride in deep mud or deeply rutted roads of mud. I only have a couple hundred miles on these so far, but I'm pleased with the ride and handling on my CB500X. And while they don't grip like a true off-road tire, I was pleasantly surprised how well they did on a fairly gnarly 2 track loop on my property that is far beyond what most people would be comfortable taking a 450lb ADV motorcycle through. It was dry for the most part that day, so I can't comment from experience how they would handle muddy conditions, but I suspect they'd get pretty slimy. Great tires for the money. So far so good. They handle great on the road and not bad in the dirt. I haven't tried them in mud yet? Great tire and a great price. If you want a good street tire with out spending alot get this awesome grip on the curves. I run these on my DR 650, and my DL 650, they work great for me. I do most of riding on pavement and a little gravel and dirt roads. Best value I've found for a 90/10 tire. Wears well, good wet and dry traction on pavement, but rough treaded enough that you can plonk down a dirt road occasionally. Can't beat the price, tires were shipped in 3 days, and they had a current year mfg date code. Put a pair on my KLR650. Rocky Mountain ATV mounted them. Neither tire needed balancing weights and are smooth at all speeds, so must be well manufactured. Good enough grip on gravel roads and a lot nicer on pavement cornering than were the stock tires. Also, a lot more rubber thickness. No question as to my happiness with them. This tire performs decently off-road. I was pleasantly surprised. It's a bit of a pain in deep sand on a KLR, but that's just a heavy bike and I don't think there's much you can do to improve that. I'm probably going to put them back on my bike now that I'm not riding almost exclusively off-road. THESE SHINKO 705 DUAL SPORT TIRES ARE THE BEST VALUE OUT THERE .I FIND THAT THEY WORK GREAT ON THE STREET WET OR DRY AND THEY WORK VERY WELL ON DIRT ROADS AND GRAVEL. NOT SO GOOD IN THE MUD.I GET REAL DECENT MILEAGE OUT OF THEM ALSO.TRIUMPH TIGER 800 2012. I have had the stock Dunlop`s - Kenda 760 - and shinko 705`s on my bike & the Shinko 705 gives me 6000 miles on the rear & more miles on the front & they are cheaper than the other two brands I listed, I ride mostly on road with a dirt or gravel thrown in here & there. can`t justify more expensive tires because their probably not going to get much more miles than a tire costing more. I had dreams of turning my dirtbike into a supermoto. Unfortunately 17s are really expensive, so I just slapped these tires on the stock rims. They have great traction and ride quality on the road. I have only had them slide out on me a few times, and I was asking for it. The front has held up really well. The rear shows a little more wear, but thats to be expected. A full set of these for the price of some other single tires? Sign me up! I only have 800 miles on this tire. The shinko 705 is a great tire the previous one had 5000 miles on it when I put the new one on. Can't beat the price can afford to change tires before they are worn out. Running them on a 1989 honda transalp xl600v. 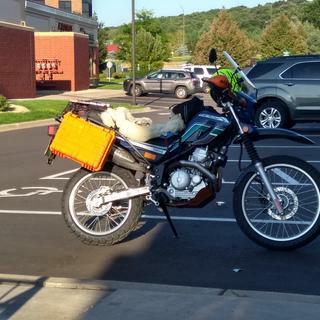 I have a klr 650 (2018). Will this tire be suitable for the rear wheel? BEST ANSWER: Yes, the Shinko 705 Universal F/R works for the rear on the KLR 650. I have purchased three so far for my first gen KLR and have had no issues with them. They do wear a little fast if you run heavily loaded like me but they are a pretty good all around tire at a great price. Great traction in the rain on pavement. A little squishy in the curves with a heavy load. Quiet on the highway. I put these tires on my KLR650 after wearing out two pair of OEM tires. These Shinko tires are far superior. The rubber is thicker, yet they ride better. Probably about twice the mileage of the OEMs. 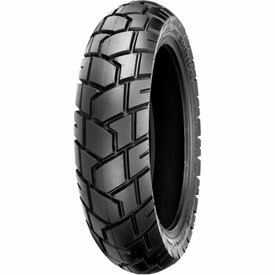 I've used this type of tire on the front and rear of my 2014 KLR. I can say they work very well and last 2 to 3 times more distance than the stock tires that the KLR come with. I loved having this tire on my KLR. Very good wear, good grip. I used it for mostly road use myself. Took multiple cross country trips on this tire. running it on my 09 KLR which I believe has the same size rim as your later model. I’m very happy with the value of this tire. Yes ,they do very well on the KLR’s. Great tread life too. Terrible in mud , but descent on hard packed dirt roads . Very good tire and priced right. Has good on road and off road manners. A true 50/50 tire. Yes i had it on a 2014 Ktm 690 Enduro R! And it was great. Is this tire good in sand? BEST ANSWER: I wouldn't recommend this tire for sand or mud, but it is however a great tire on the road (pavement) and hard packed gravel roads. I did a 7200 mile trip mostly regular roads and 10% dirt and this tire held up great. Front was still almost like new and rear was about 60-70%. Bike is a WR250R. Not to sure. I try to avoid sand if possible. I ride a KLR 650 and it is not good in the sand to begin with. Its a great all around tire. If you are talking deep sand - no, you want a knobbie. I used them on hard packed sand and sandy trails with no problem though. This tire is not going to get you thru sand very well. This tire has long wear, and is good on wet and dirt trails/roads. No , not really . The Shinko 705 is a more street oriented tire that will work for some fire roads or hard pack . Based on my experience I would say no. Good on hard stuff, pavement, rocks etc. Not so much in sand or mud. No, it does poorly in sand and mud. Great highway handling, and does good on hard packed dirt roads. I'd like to get both the front Shinko Tire to match this rear but is it normal to have one tire that is tubed and one that is tubeless? Which one are you looking to run tubed/ tubeless? I have the 705's on front and rear. The rear has always been tubed and has worked well for me- got ~8k miles on a KLR in touring config with lots of weight. Just replaced it with a new (also tubed) 705 at the beginning of the season. The bike came with the 705 on the front and I haven't had to replace it yet, although it's getting close now. I have about 13k miles on it, but no idea how many the previous owner put on it. What kind of riding are you looking to do with it? I haven't had a motorcycle that uses one tube and one tubeless tyre, I have this set of tyres on a Suzuki V strom, it's a dual motorcycle, and In love this tyres. They're perfect for the highway and excellent for trail riding, nothing to extreme, but great tyres non the less, great mileage ! I don’t know that I would call it normal but it’s not unusual. I have a bike with a tube type front and tubeless rear tires. Just make sure if it is a tube type tire that you use an inner tube, even if you have a tubeless type wheel.